Abstract: ABIT's newest flagship Athlon64 motherboard is the ABIT AN8 32X, based upon the nForce4 SLI x16 chipset. For the moment, if you count yourself as a computer enthusiast the best motherboard you can get is one based on the nVidia nForce4 SLI x16 chipset... ATi's CrossFire is just a little underwhelming in the real world. ABIT are a motherboard manufacturer whose name should be very familiar in this industry. ABIT did after all virtually pioneer overclocking as we know it. 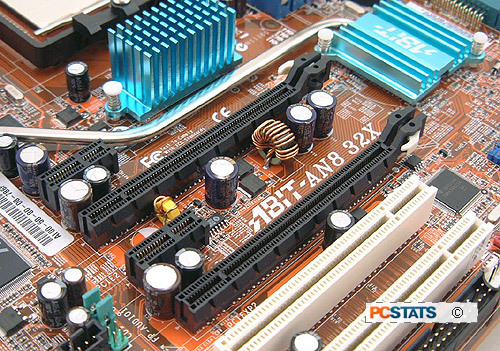 While its motherboards generally receive good press, the company had run into a spot of financial difficultly in 2005. However, the merger in early 2006 with Universal Scientific Industries (USI) solved its fiscal issues, breathed new life into its management, and left the company with a slightly different name; Universal ABIT. ABIT's back and it's getting ready to give DFI, ASUS, MSI and Gigabyte a serious run for the money. It's newest flagship Athlon64 motherboard is the ABIT AN8 32X, based upon the nForce4 SLI x16 chipset (nVidia C51D and CK804 SLI). As you know, the nForce4 SLI x16 chipset allows two nVIDIA PCI Express videocards to run in SLI mode with each card receiving the full 16 PCI Express lanes. There is no bandwidth sharing between SLI videocards with this particular nForce chipset. 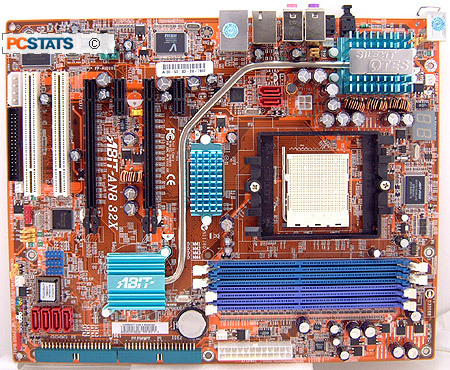 The ABIT AN8 32X motherboard supports all Socket 939 AMD Athlon64/X2/FX processors, and its four DDR DIMM slots will handle as much as 4GB of PC3200 non ECC unbuffered DDR memory. The motherboard has a host of handy features; high definition 7.1 channel audio, Gigabit LAN, IEEE 1394a Firewire, an additional Serial ATA II/RAID controller and my personal favorite the Port 80 diagnostics card. As with virtually all of ABIT's performance oriented motherboards, the rear I/O panel is a little differently layed out, although this is by no means a legacy free motherboard. Expansion is taken care of with the pair of aforementioned PCI Express x16 slots, two more PCI Express x1 slots, and two 32 bit PCI slots. All this in an ATX-sized motherboard with a sticker price in the neighborhood of $208 CDN ($178 USD, $102 GBP) makes the ABIT AN8 32X one of the most affordable nForce4 SLI x16 boards out there... We'll have to see if its performance in the benchmarks stands up to the competition! The layout of the ABIT AN8 32X motherboard is quite similar to the ABIT AN8-SLI that PCSTATS reviewed a few months back. Considering how close the nForce4 SLI and nForce4 SLI x16 chipset are, similar motherboard layouts is not all that surprising. Regrettably, a few of the same quirks have lived through the revision and persist like mosquitos on a hot summer day... but we'll get to that in a bit. Flagship motherboard always get the royal treatment from manufacturers. For instance, the ABIT AN8 32X motherboard includes four actual 1.44MB floppy diskettes with drivers for the NVRAID, SiI3132, NVRAID WinXP64 and SiI3132 WinXP64 hard drive controllers. Depending on what you're using, and which operating system, pressing 'F6' during the boot up process won't be a pain with this package! Speaking from experience, nothing is more frustrating than going through the process of reinstalling a PC and coming to the point when the OS is asking for drivers on floppy disks... and you don't have them... or a computer to put them on the floppy anymore. With most motherboards, the RAID or SATA drivers are packaged onto the driver CD, not exactly handy. Incidently, there are two IDE channels, and a total of six SATA headers on this motherboard (four of which support RAID at 3Gb/s). 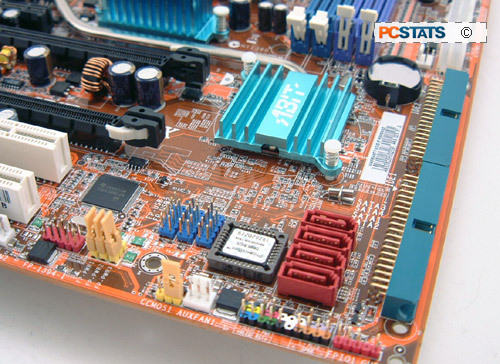 Computer enthusiasts often have multiple cooling fans in their systems, and the ABIT AN8 32X comes with a total of five fan headers, four free after the CPU heatsink fan has been attached. That'll give you plenty of options in terms of fan placement. Pg 4. Overclocking Tests, Trials, Triumph?